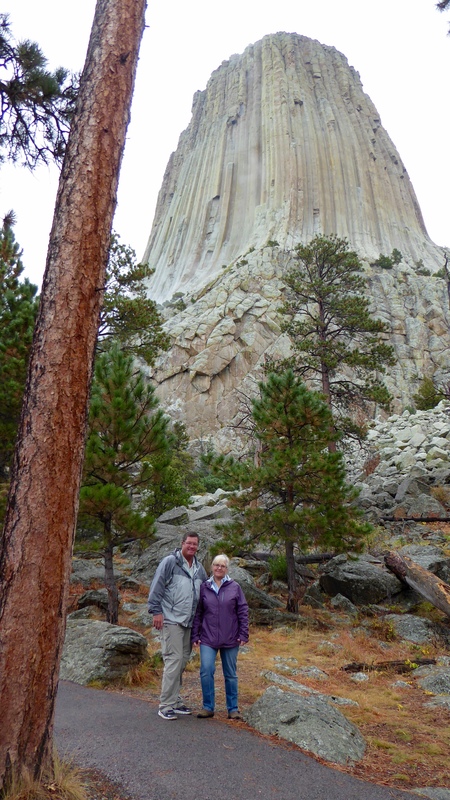 On the first day of re-retirement, our plan was to travel 300 miles to Devils Tower in northeast Wyoming. It would be a long driving day but we hoped to get there mid-afternoon and still be able to see the tower and go to the visitor center. We fought our GPS repeatedly as it wanted to send us on shorter routes through the Crow and Cheyenne Reservations. Having lived on the “rez” for a month, we believed the longer I-90 route would be more likely to have diesel fuel and have better road quality which wouldn’t rock and roll our trailer quite as much. 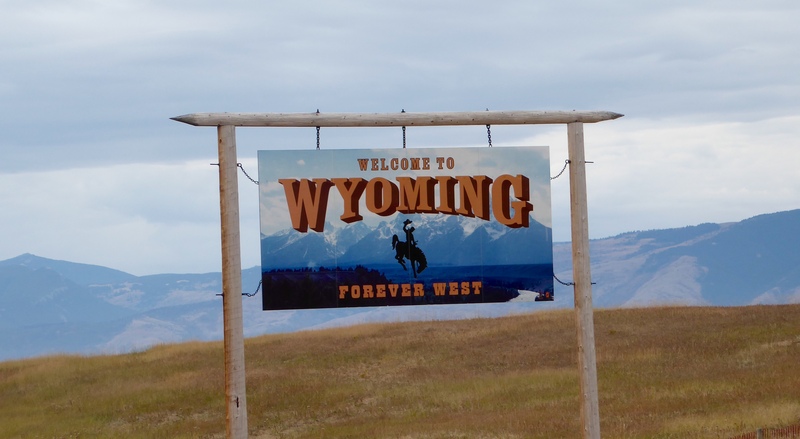 We made it into Wyoming and, as we approached the town of Buffalo, the warning alarm sounded on our Tire Pressure Monitoring System. 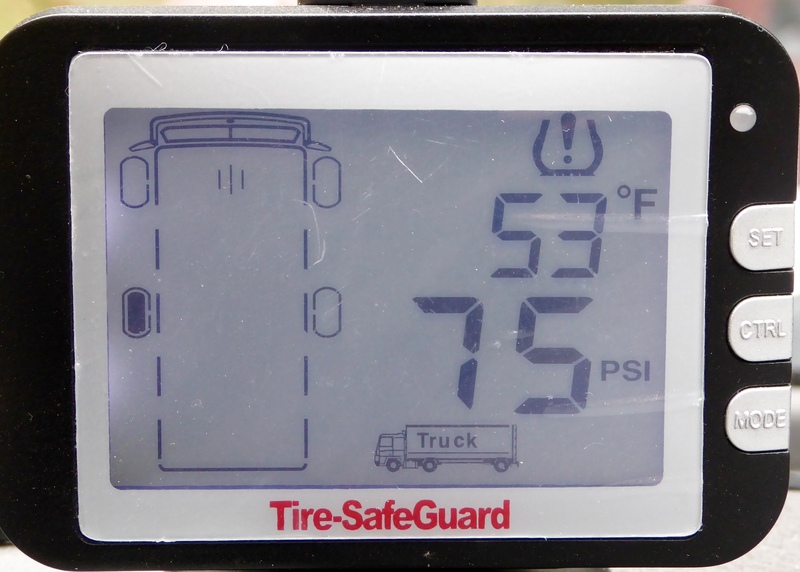 The TPMS measures and continuously updates the temperature and air pressure on all eight truck and trailer tires. 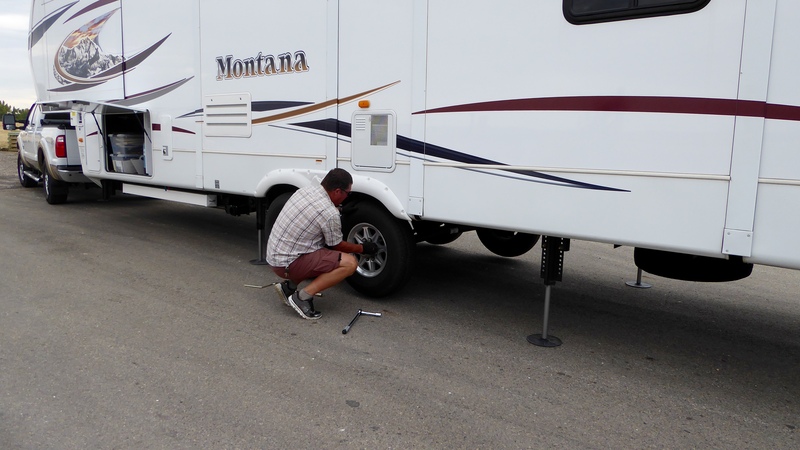 We had an issue with the driver’s side back trailer tire. The tire pressure usually measures 80 – 95 psi. The alarm sounded when the pressure reduced to 75 psi. In the few minutes that it took to get off the freeway and find a place to be, it was down to 21 psi on that tire. It was pretty flat! Randy decided he needed to change to the spare tire. Fortunately our auto-leveling jacks make that job a little easier than it would be with a typical jack. While he was changing the tire, I scouted for a tire store that had room for all 65 feet of us. 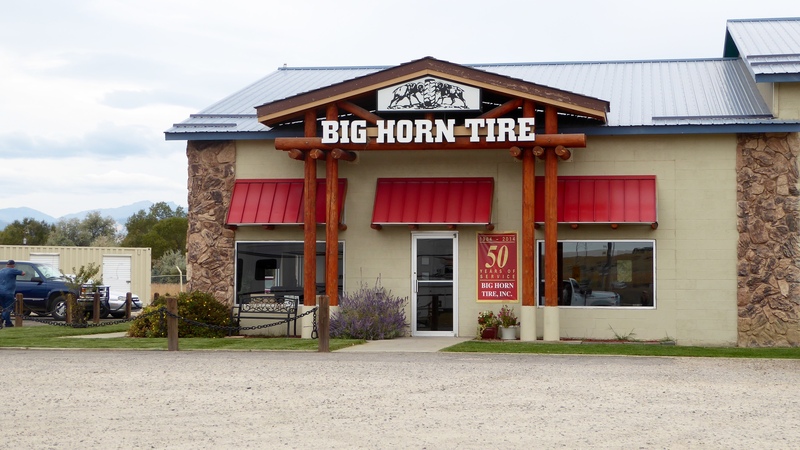 Thank you Big Horn Tire for having room and making time for us right away. We are now the proud owners of two new Maxxis tires. Our Goodyear set on the back were only 16 months old (and four of those were sitting still) yet the steel bands were separating. We had multiple leaks in one tire and bulging in the other. 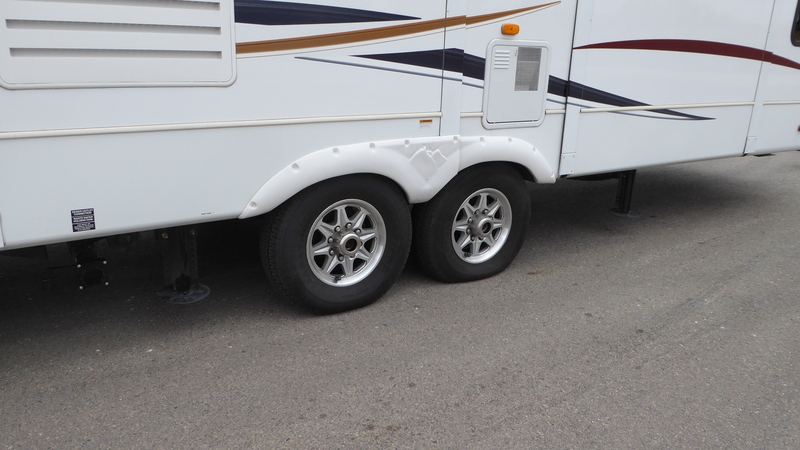 There is still a second set of Goodyears on the trailer that are about 9 months old. We’ll see…..You can’t mess with tires in this lifestyle. Even though having a tire problem isn’t a good thing, we were blessed in how it happened. We are thankful that we had the monitoring system to alert us before we had a damaging, dangerous incident. We were also happy that we had opted to go on I-90 and that the tire held off the leak until right as we were approaching Buffalo. After a few more arguments with the GPS, we made it to Devils Tower KOA. This is one of the nicest KOAs we have ever stayed in with a wonderful view of the tower and deer and turkeys roaming the grounds. 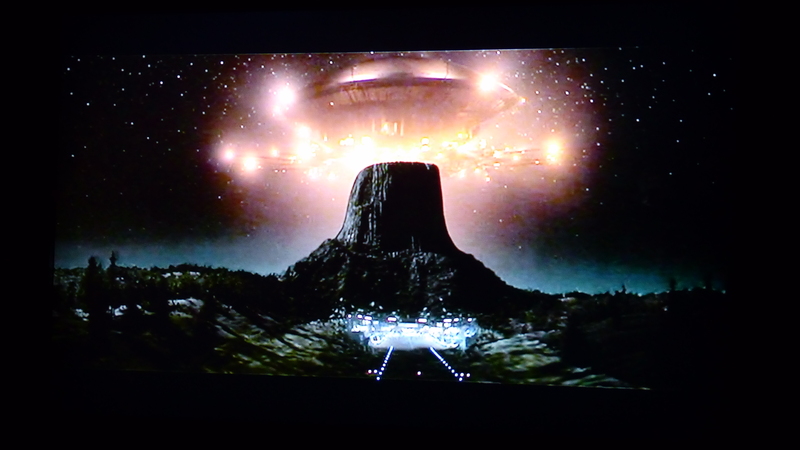 Another perk is that they have nightly showings of Close Encounters of the Third Kind (1977) which was set at Devils Tower. We were a little bummed to hear they had discontinued the showings for the season but really happy when they gave us a DVD to watch inside our nice warm trailer instead! 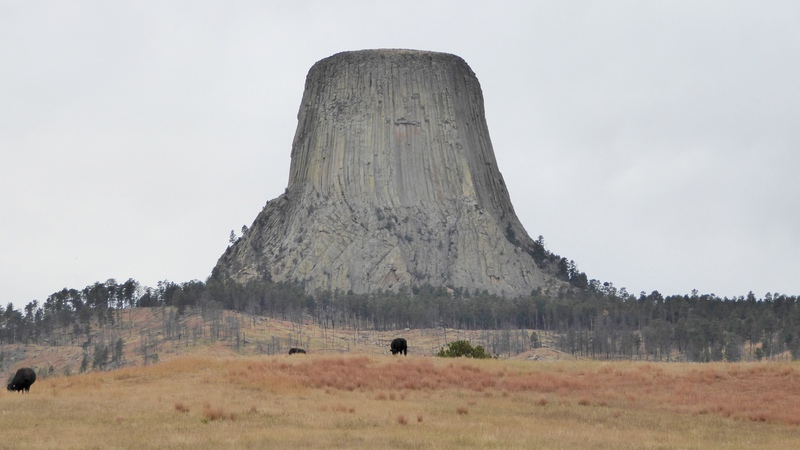 Devils Tower was the very first US National Monument, designated in 1906 by President Theodore Roosevelt. It was the very first use of The Antiquities Act, authorized that same year. The apostrophe in what should have been Devil’s Tower was inadvertently left out due to a clerical error and was never corrected. Thus, Devils Tower is the correct spelling. 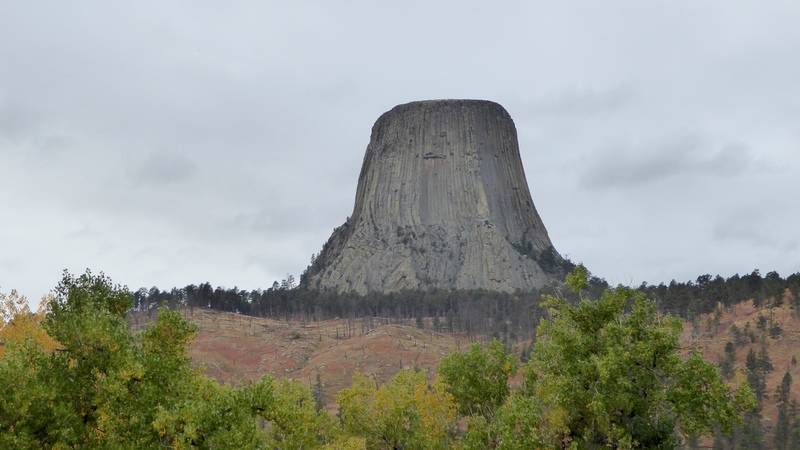 Twenty tribes view this igneous rock as a sacred site and oppose the name Devils Tower. 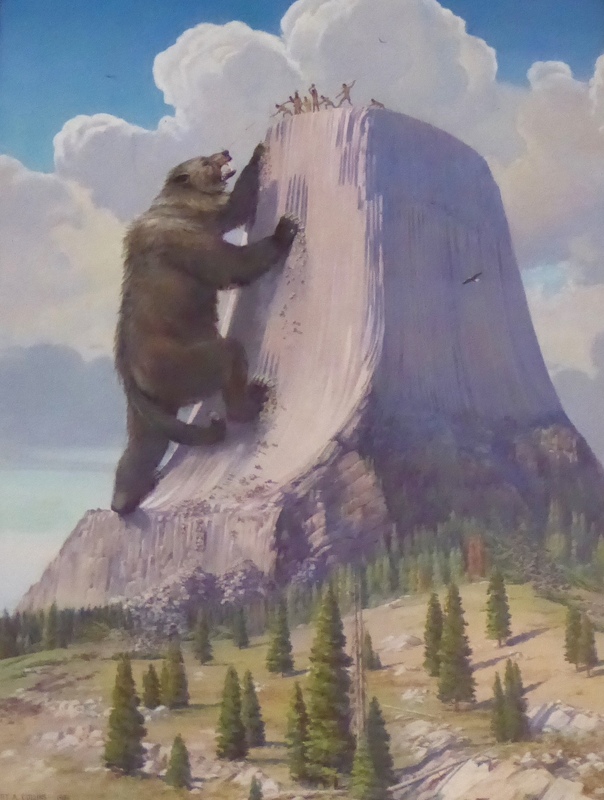 As most tribal names had some reference to a bear, there has been some effort to rename the monument Bear Lodge but it has not gained traction. The formation of the tower does look like claw marks from a distance. Actually they are symmetrical columns, some of the longest (up to 600 feet) and widest (up to 20 feet) in the world. They are 4, 5, 6 and 7 sided with six sided columns thought to be the strongest in nature. Columns are gradually made vulnerable by water and ice, lichen and plant roots. Although there is a boulder field around the tower, there has not been a column collapse since monitoring began in 1906. The top of the tower is rounded, grassy and about the size of a football field. In 1941, George Hopkins parachuted on to the top. He had to wait six days to get off when mountain climbers could make it to up him to help him down. He really failed to have an exit strategy! The tower was first climbed in 1893 by William Rogers and Willard Ripley. They constructed a 350 ft. wooden ladder by hammering stakes into a crack which aided in their ascent. Two years later, Linnie Rogers followed her husband’s climbing achievement with her own. 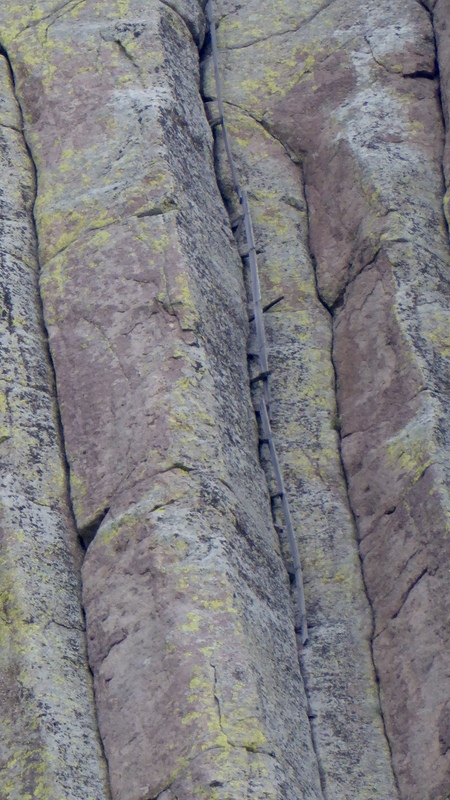 As many as 200 people eventually used the ladder, parts of which are still visible. 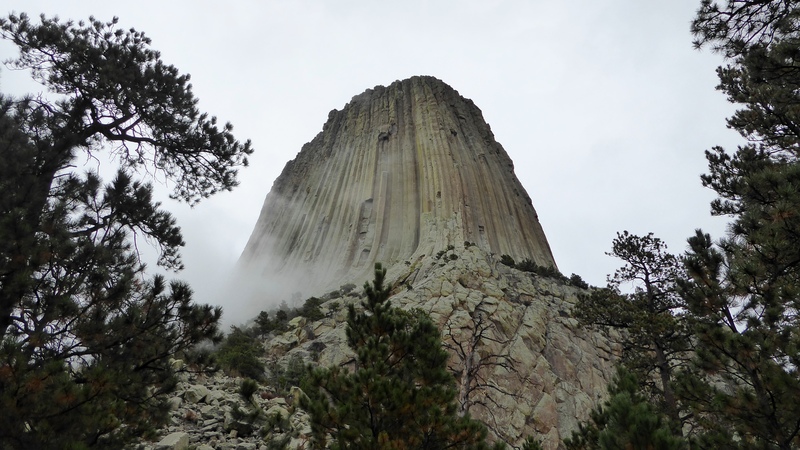 Climbers now ascend Devils Tower with the support of the National Park Service. However, climbing is voluntarily stopped in June in consideration of the sacred nature of the site to many native peoples. 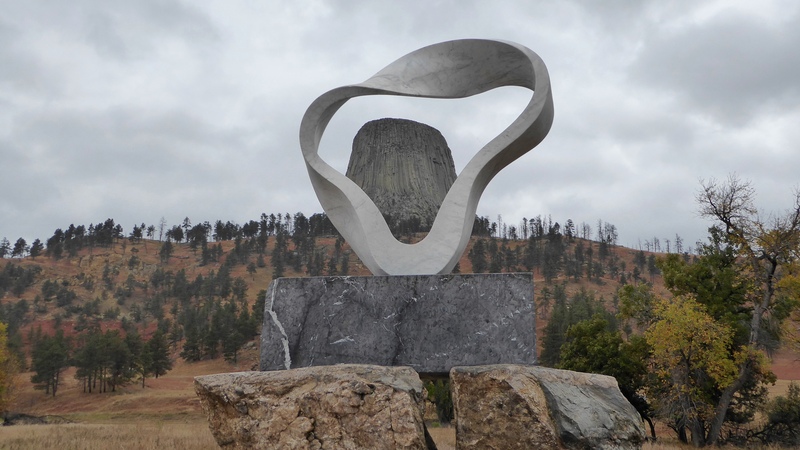 Given its sacred past, Devils Tower was chosen as an International Peace Project Site by Japanese Artist Junkyu Moto in 2008. (The other two sites are Vatican City, Rome and Bodh Gaya, India, where the Buddha reached enlightenment.) His sculpture here is called the Circle of Sacred Smoke. So, even though we had a devil of a time getting here, we are glad we came to Devils Tower. It was a joy to be on the move again, exploring new places and learning new things. Randy said several times today that he loves feeling retired again! 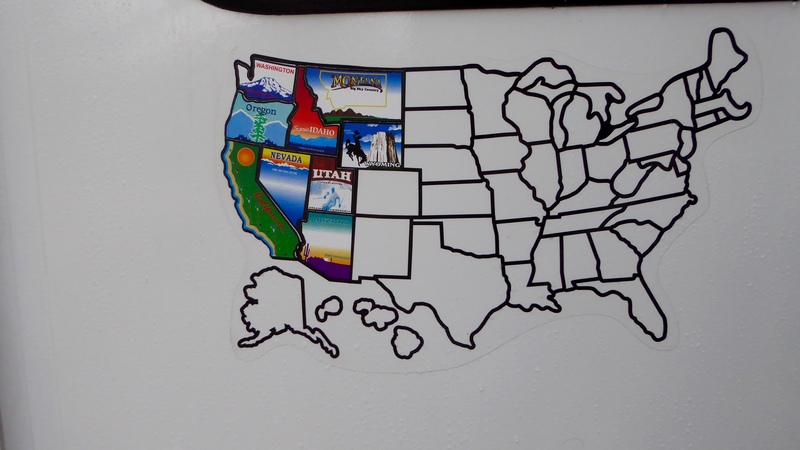 We live full time in our fifth wheel and travel and volunteer. We remember everyday how blessed we are to have the opportunity to live this season of our lives in this way. Great history lesson. When do I take the test? I love tests. You past educator, you. (And me too.) I’d always prefer a test to one of those group projects…. Wait, maybe I’m on a group project now with Randy and Elko! Glad you enjoyed the post. Driving Through A Desert Snowstorm!